When GIANTS Software made Farming Simulator available to customers through Amazon Underground in 2015, they saw 3.6x the downloads from Amazon and 1.4x the revenue in the first month. Getting paid for every minute that a customer uses your app means that you can focus on building games that encourage more customer engagement, and in fact, more engagement will earn you more revenue. This is how the team at GIANTS Software has always built their games and we saw that reflected in their earnings when they moved to their game into Amazon Underground. “While [Amazon Underground] does generate many downloads, players also spend a lot of time with our game on the platform. Our games are deep, complex and offer players many hours of content. Farming Simulator has a lot of content. If you play for 20 hours, you may only experience half of the game. There’s a lot of content with over 60 items to combine, a career system where you can buy and sell items and it’s an open world so you can explore. Thanks to the unique monetization model this quickly lead to a significant increase of our total revenue generated with the product.” - Christian Ammann, GIANTS Software. Amazon Underground gives developers the opportunity to focus less on monetizing, and more on creating great user experiences. 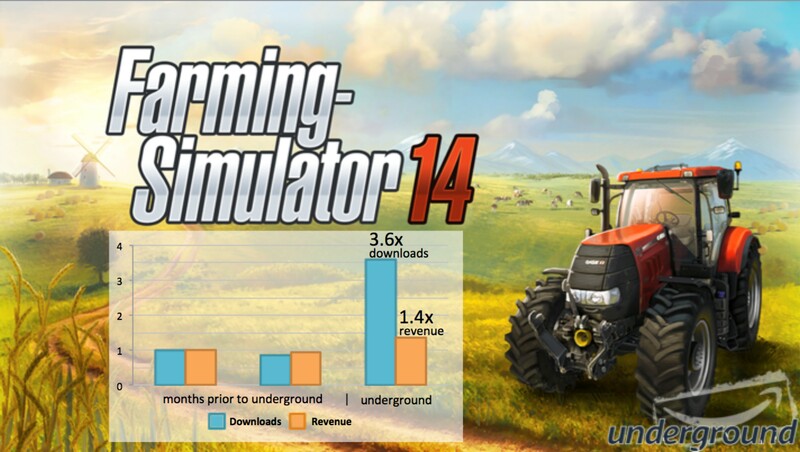 GIANTS Software has done just that with Farming Simulator 14. They built a game with a great user experience that engages their customers for long periods of time, and with Amazon Underground, they are generating revenue from 100% of the minutes played. You can download Amazon Underground onto any Android phone from www.AmazonUnderground.com and play Farming Simulator 14, 100% free. Beyond offering this new monetization model, we’re focused on making it easy for you to distribute your existing apps to Amazon customers. If you’re interested in submitting your app for Amazon Underground, here’s how you can get started. Prepare Your App – Learn how to get your app ready. Register for Free – Sign up for your Amazon developer account. Submit Your App – Opt in to Amazon Underground during the submission process. Amazon Underground is a new app for Android phones. It has all of the functionality of our regular Amazon mobile shopping app, plus an exciting addition: over twenty thousand dollars in apps, games and in-app items that are 100% free for customers. For you app developers, Amazon Underground includes a new monetization model where Amazon pays you based on the amount of time your app is used. With Amazon Underground, you can turn 100% of your Android users into revenue generating customers.